As the originator you’ve done every perfectly. You found your borrower; you took a perfect application and gathered every required document and submitted it to your processor. Your processor entered the borrower’s information and created your loan estimate form. You call your borrower back with great news telling them that they’re approved, and you’re emailing them their loan estimate and request a meeting to go over the figures and finalize the deal. OOPS! Your borrowers calls you back and has some questions. Its seems they’ve been shopping around and some of your fees are higher than your competitors? Without the help of your manager? Not To Worry; You Won’t Have To Call Your Manager. 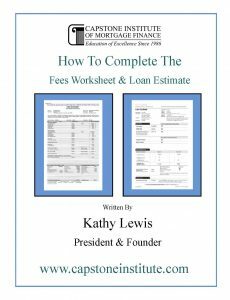 After completeing this training you’ll understand how every box in the fees worksheet and loan estimate is calculated. In seconds you’ll be able to check any part of your the Fees Worksheet and the Loan Estimate using your own calculator. That’s the great thing about Capstone’s training, we teach you how to calculate everything using your own calculator. 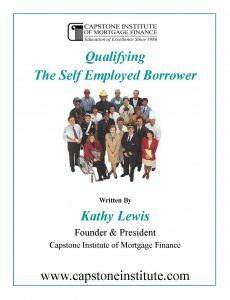 This also means learning any new mortgage origination software is going to be easy because you already know how the numbers work and where they go. Please open our Table of Contents below to see how detailed this training is.